In thy light we see light. – Psalm 36:9. The natural state of man is a state of darkness. His vision is indeed clear enough for the discerning of natural objects; and the sun in the heavens pours his radiance around him, to delight his eye and to illuminate his path. So too he has the faculty of viewing the qualities of the ten thousand objects by which he is surrounded—of looking over the creation with the intellectual as well as the bodily eye—of admiring as well as beholding the beauty, and grandeur, and harmony, which pervade the works of God. And more than that—he has a certain kind of moral discernment, by which he sees the immutable distinction between right and wrong, and the unchanging obligations of man to yield obedience to his Creator, and the fearful recompense of transgression under a wise and righteous government. All great truths, both natural and revealed religion, are, in a certain sense, fairly within the scope of his vision; and he can speak of them, and speak of them honestly, with reverence and admiration. But notwithstanding all this, the remark with which I began is true—emphatically true—that many is naturally in a state of darkness; else what means that declaration of the Apostle that “the natural man receiveth not the things of the Spirit of God, for they are foolishness unto him, neither can he know them, because they are spiritually discerned?” The truth is, that man, with the eye of his natural understanding, can look—if I may be allowed the expression—at the exterior of God’s truth; but he is incapable of penetrating beneath the surface. There is in it a depth of spiritual excellence and beauty—an adaptation to meet the inward cravings of the soul, and to exalt and glorify its all-wise Author, of which he has no knowledge. He has not penetrated into the sanctuary of experimental religion. He may talk even in rapture of the spiritual glory of the gospel, and may imagine that he has felt its power; but it is an imaginary experience, and nothing more. The true light has not shined into his soul; for the film that naturally obstructs his spiritual vision has not been cleared away. I say then, the Christian, even in this imperfect state, sees light in God’s light. In the contemplation of His truth, as it is revealed in His Word; in the experience of His grace, as it refreshes and elevates his soul; he walks in the light of the divine countenance. When he contemplates the glory of God’s providence, the glory of Redemption, the anticipated glory of Heaven,—especially when the eye of his faith fastens upon Christ, in whom dwells all the fullness of the Godhead, whose presence is the bliss, and whose praise is the employment of, the ransomed,—I say, when these wonderful subjects come before his mind, he seems himself to be walking in an immeasurable field of light, and the illumination of the sun of righteousness well nigh entrance his soul with ecstasy. In the experience of Christians, the intense joys to which I have here referred, are by no means constant; and many perhaps, may remain strangers to them through life; but all, all without exception, who have been born from above, have some new views of spiritual objects: if there is not the joy that is unspeakable and full of glory, there is ordinarily the peace that passeth understanding; and in every case there is a spiritual relish for God’s truth, which develops itself in earnest aspirations after Heaven, and which has in it the elements of heavenly glory. But we may consider the text, in its ultimate bearing, as looking at the condition of the Christian in a future world rather than in the present; that world in which we are to “see face to face,” rather than this in which “we see through a glass darkly.” There are some beams of spiritual light that bring gladness to the Christian’s soul here; but there it will be light without shade; the sun of righteousness will shine forever in His glory without the intervention of a cloud. I know, my brethren, that our views of Heaven are at best exceedingly imperfect. There is a depth of meaning in the descriptions which inspiration has given of it, which it might defy even the seraph before the throne to fathom. It were vain for us, for instance, to attempt to decide in what part of the universe will be the city of our God; or to form any adequate conception of that splendid garniture with the Creator has adorned it. Conceive of a city which is of pure gold; the walls of which are of jasper, and its foundation of all manner of precious stones, and its gates of pearl, and its very streets transparent, so as to reflect every image of beauty and grandeur. Conceive that it is illuminated by the presence of the Lord God Almighty and the Lamb; and that the nations of them that are saved walk in the light of it, and that the kings of the earth do bring their glory and honor into it; and then, if you can analyze this conception, and tell what is included in all this burning imagery, you have some idea of Heaven. 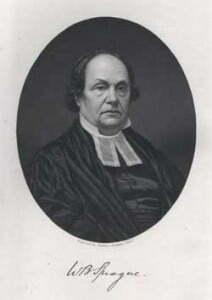 Readers who wish to read the full sermon may click the embedded link provided here: A Sermon preached in the Second Presbyterian Church, Albany, February 9, 1845, the Sabbath immediately succeeding the Death of Mrs. Oliver S. Strong of Jersey City, Daughter of Archibald McIntyre, Esq. of Albany.